My husband and I surprised our son with a homemade hockey stick coat rack and shelf on his 8th birthday (a Winnipeg Jets themed party). I had planned this months in advance and collected old sticks from various rinks, garage sales and Kijiji. The furniture was very inexpensive to make as most of the sticks were free (or very cheap) and I picked up a pail of old pucks from a garage sale for 50 cents each. Line the hockey sticks up side by side with the blades tips touching. Stand the three sticks up and carefully measure from the blade (floor) up 12″ and mark all three sticks on the shaft. (Sticks will be standing vertically with a slight angle to rest against the wall and the measurement will go from the floor and extend 12″ up the shaft.) This will be where the bottom puck support will be attached in the middle of the three sticks. If it is easier, you can lay the sticks down for the other measurements, but be sure blades are lined up. The top puck support will be about 24″ from the tops of the sticks. I wanted mine to have a staggered, less uniform look, so my three sticks were all different heights. Just be sure to mark the spot where the puck will be drilled in on all three hockey sticks. The final puck will go midway between the bottom and top puck supports. Use the 2″ screws to attach the sticks to the puck supports. You will be screwing through the thickest part of the shaft, with the blade facing you. Use the marks as a guide. Begin by attaching all three pucks (at the pre-measured levels) onto one stick. The puck will be drilled to the back of the shaft at the three different heights. Once the first one is done, you will want to make sure that the other two sticks are evenly spaced around the pucks (at approximately 1/3 intervals). Secure all three sticks to the pucks in the middle. You may wish to pre-drill holes in the puck just to get the screws started more easily. Attach one coat hook on the front of each hockey stick shaft. Again, ours were purposely staggered at different heights. This project was simple to do and inexpensive to make. It is sturdy and makes a great addition to any hockey themed room. 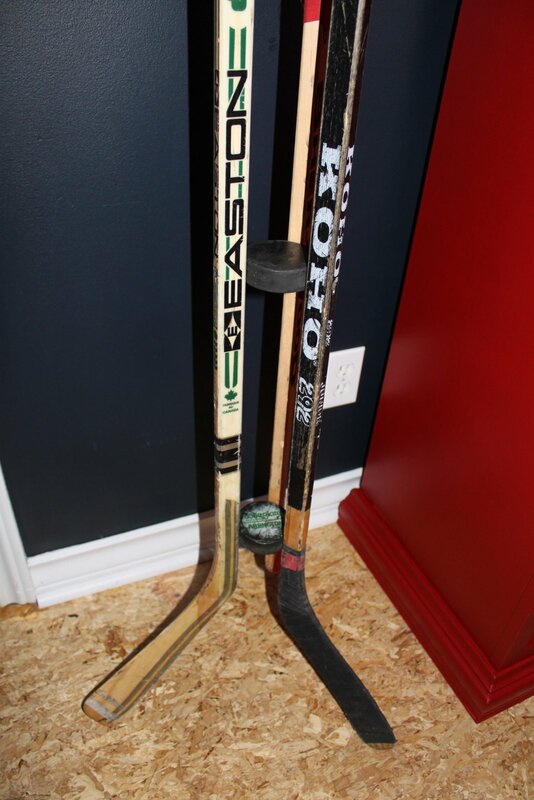 Posted on August 14, 2013 by Cindy Roy •	This entry was posted in DIY and Upcycling and tagged hockey coat rack, hockey decor, hockey room ideas, hockey stick coat rack, hockey stick coat rack tutorial, hockey stick furniture, how to make a hockey stick coat rack, NHL room ideas, stick and puck rack. Bookmark the permalink.